Did Mayor Bowser’s “Big Deal” team listen to the court in the McMillan case? Or did they just listen to themselves? 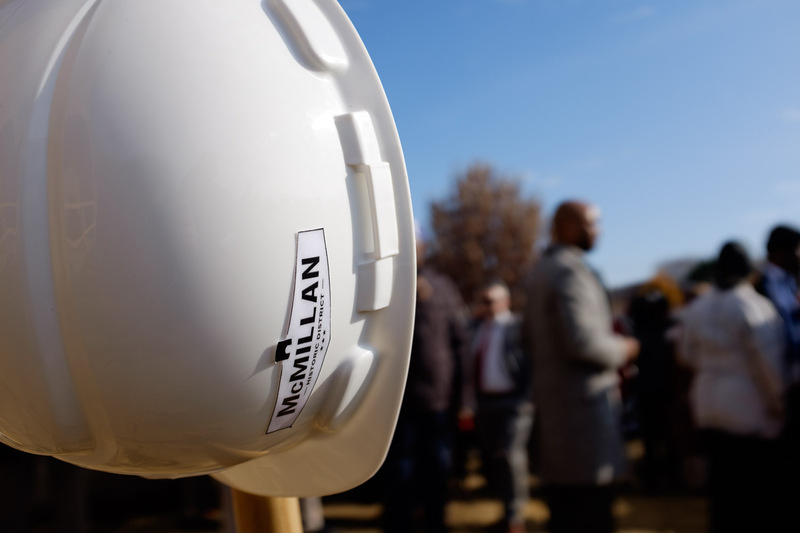 The skies were clear and blue in the winter sunlight in early December 2016, as Mayor Muriel Bowser plunged a gleaming shovel into a pile of sand and declared the ground broken at McMillan Sand Filtration Facility. The 25-acre expanse on North Capitol Street with the odd cylindrical towers marks a historic landmark that served as D.C.’s primary water filtration facility for most of the 20th century, and has become ground zero for resistance to developer-driven city planning in recent years. Make that decades. Since the 1990s, citizens groups have protested, advocated, agitated and litigated to force the city to develop the site with less density, more green space and an emphasis on historic preservation. Yet as Bowser and a phalanx of city officials, builders and political players posed for TV cameras one could imagine the sound of bulldozers. So, imagine the Mayor’s indignation when, the next day, the D.C. Court of Appeals nixed her administration’s zoning approvals to demolish and subdivide the historical site to make way for a 2 million square-foot mixed-use project to be anchored by health facilities near the Washington Hospital Center, the Children’s National Medical Center and the Veteran’s Administration hospital. The timing could hardly have been a coincidence. Invoking the D.C. Historic Landmark and Historic District Protection Act, the court instructed planning officials and a developer handpicked by a Bowser predecessor to specify why the project warrants such imminent loss of the historical aspects of the site. Now, almost 20 months after Bowser’s comeuppance, the Mayor’s Agent has again cleared the McMillan site for demolition and subdivision, and again, her development machine faces a court challenge to its regard for D.C.’s zoning and historic preservation laws—and the judgment of the Court of Appeals. Such persistent challenges in recent years have drawn criticism, outrage and disdain from builders, urbanists and “smart growth” advocates who complain that a culture of “No” is standing in the way of development. Yet opponents to the current proposal at McMillan have long maintained their goal to force the District to respect its own laws and temper its planning strategies; Density development and commercial objectives, they say, can be accomplished within the outlines of the zoning code and the D.C. Comprehensive Plan, a planning document that the political and business establishment would prefer to overhaul. Ask one of the “Friends of McMillan Park,” the group behind the legal challenge, and they’ll say what they really want is a competitive bid process to select a developer that invites more holistic proposals. In the meantime, Bowser is stuck with a court mandate to show, in detail, why the proposed project is so special that it warrants destruction of a landmark. Should she prevail, McMillan’s demolition could be imminent; Should she fail, the proposed plan could be doomed, absent bona fide, wholesale changes. 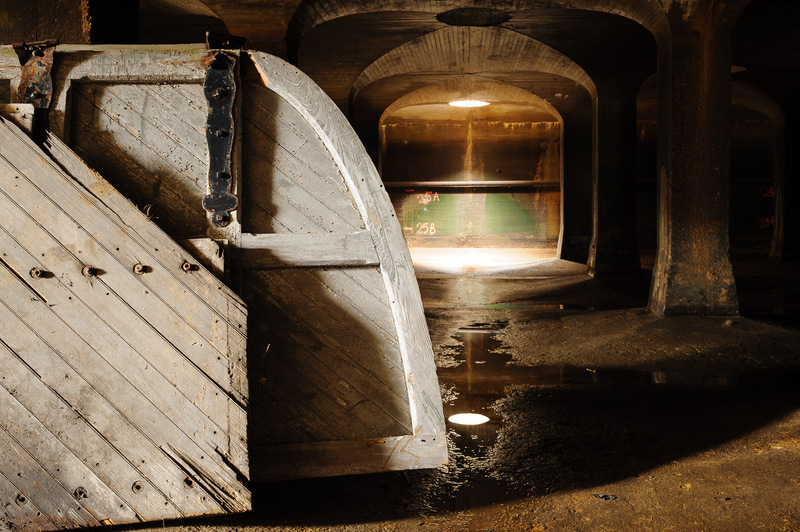 A vaulted sand cell that filtered and purified Washington, D.C.’s drinking water from 1905 until 1986. McMillan is an urbanist’s dream, a chance to bury relics of the past and advance a proliferating if not formulaic model of urban growth. The politics can be ugly. Opposing economic theories and ideologies about land use policy can provoke heated and sometimes personally insulting debate. But the timeline of how the project has ended up before the Court of Appeals for a second time is hard to dispute. 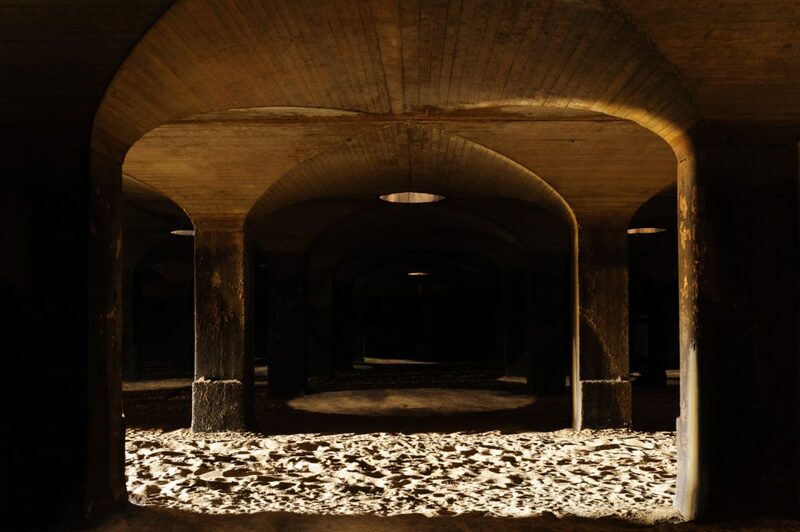 An engineering marvel, with landscape designed by Frederick Law Olmsted Jr., the facility received Potomac River water channeled underground from the Dalecarlia Reservoir in Palisades to an adjacent reservoir. The water then flowed underground to the sand cells, where it was filtered and purified for drinking. With the advent of chemical purification, The Army Corps of Engineers decommissioned the facility in 1986 and sold the site the following year to the District for $9.3 million. In 1991, it was designated as a D.C. Historic Landmark for its historic, cultural, landscape, planning, engineering, and architectural significance. Development proposals stalled during the 1990s and the site lay fallow, until 2002, when the Office of Planning under then-Mayor Anthony Williams approved a plan endorsed by community stakeholders, including a group that would later organize as Friends of McMillan Park. The plan recommended medium-density housing and retail, and emphasized open space, historical preservation and cultural amenities. In 2006, a consortium called Vision McMillan Partners, consisting of EYA LLC, Trammell Crow Company and Jair Lynch Development Partners, won a competitive bid to serve as a “Land Development Partner” with the National Capital Revitalization Corporation, a quasi-government development agency. The solicitation had specified that the winning bidder would “embrace and adaptively reuse the historic nature and features of the site,”and select a “Master Developer” in a separate bidding process. Over the next several years, DMPED worked exclusively with VMP to obtain zoning and planning approvals from agencies controlled by the Mayor—essentially asking itself for permission to abandon its community agreement and free itself from the planning blueprint established in 2002. In 2015, I wrote a four-part series for Capital Community News that detailed the tainted history of the attempts to redevelop McMillan, including a decision by DMPED to subsidize VMP’s pre-development costs to pay for engineers and architects, and lawyers to lobby the D.C. Council. At one point, VMP hired a Baltimore-based PR firm to “discredit” the Friends of McMillan Park and attempted to bill the city for the firm’s services. The Council ignored Patterson’s report and approved the disposition of the site to VMP, with Chairman Phil Mendelson—who once had formally opposed the proposed project—proclaiming that “the train has left the station.” Predevelopment costs to the city have ballooned to nearly $15 million in the name of what Bowser says will result in 6,000 jobs, hundreds of units of affordable housing and $1.2 billion in “economic activity” over the next 30 years. Following the court’s December surprise, however, the Mayor’s Agent scheduled a public hearing, in January 2017, to address whether the project’s historic preservation benefits outweigh its harms; determine what specific architecture, land planning or community benefits are necessary to make it a project of “special merit” and thus exempt from the Preservation Act; and decide whether any alternatives could confer special merit with less demolition and subdivision. In April of this year, after substantial deliberation and delays, the Mayor’s Agent issued a decision that again cleared the site for demolition and subdivision. Earlier this month, the Friends of McMillan Park petitioned the court for a review of that order. VMP and DMPED have filed briefs as well. A threshold issue for the group is: Why does the Mayor’s Agent have the last word on zoning decisions when he is accountable only to the Mayor? By all appearances, the Mayor’s Agent role is indicative of the District’s self-serving bureaucratic structure. As both Director of the Office of Planning and the Mayor’s Agent, Eric Shaw is a subordinate of Deputy Mayor for Planning and Economic Development Brian Kenner, whose office is co-developer at McMillan, and who is a subordinate of the Mayor. In response to objections that the Mayor’s Agent might therefore pre-judge cases out of loyalty to (or fear of) the Mayor, a finding was made that, as long as decisions are accompanied by an extensive and complete record, there is no grounds for complaint. That finding was made by…the Mayor’s Agent. A “McMillan Historic District” helmet that was worn during the ground breaking ceremony for the redevelopment of the sand filtration facility on December 7th, 2016. A review of the Mayor’s Agent’s findings—and the corresponding briefs filed by VMP and DMPED— suggests that the Bowser administration has not been responsive to the Court of Appeals order of 2016 so much as it has engaged in a self-fulfilling prophecy. Much of Shaw’s April 3 decision reads like a promotional document that could have been drafted by VMP, sprinkled with superlatives and concessions for preservation, community benefits and open space. The plan is to divide the site into seven parcels that include a large healthcare building with ground floor retail surrounded by “substantial open space”; a preserved sand cell and a “healing garden”; another healthcare building “to be built at a later date”; a pair of multi-family residential buildings, one with a supermarket; 146 row houses; and a public park with a recreation center. The site will be loaded with amenities, he writes: A 6.2-acre green space, a 17,500-square-foot community center, a “sprayground” and an amphitheater; a community center, swimming pool and fitness center with shower facilities; free public Wi-Fi. There will be “a significant amount of affordable housing,” according to Shaw’s findings. 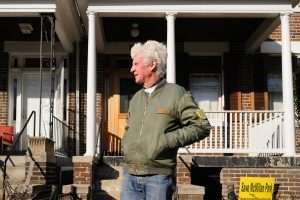 That includes “at least 20 percent” of housing units dedicated to people earning between 50 and 80 percent of area median income, or AMI, including 22 of the row house units. More than 7,000 jobs will result from the project over the next seven years, Shaw projects, as will small business opportunities and investments in job training and educational programs. Here, Shaw’s analysis is essentially a read-back of the standards that relies mostly on elements of what one might expect from commercial developments taking place all over the city. He concedes that “much of [McMillan’s] open space character will be lost,” and argues that 16 of the sand cells can’t be preserved because they are in “poor condition,” but then he finds that the proposal is “sufficiently special” by virtue of its affordable housing, recreation and open space, mixed use, site plan and design elements, economic benefit to the District, and its community benefits package. Shaw’s decision is gibberish to Kirby Vining, a key member of the Friends of McMillan Park and chairman of the McMillan Advisory Group. 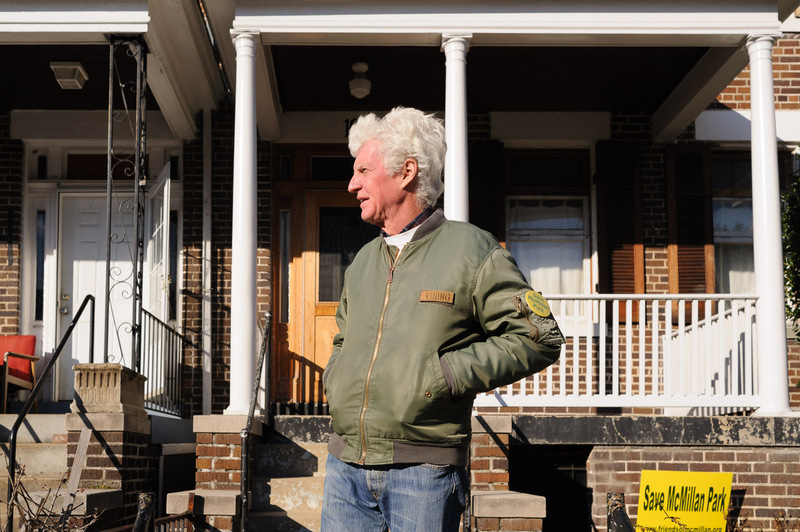 A retired foreign service officer who lives directly across from the site, Vining, with his thrift store Navy pilot’s jacket and shock of snow-white hair can be seen testifying at public meetings and hearings and is posted on Sundays at the Dupont Circle Farmers Market, where he uses storyboards to engage passersby with the site’s history and current events that will decide its fate. Urbanists counter with bitter complaints over legal appeals like the one the Friends of McMillan Park has filed, or with more nuanced positions that touch lightly on government accountability. Writing for Greater Greater Washington in April, David Whitehead took the latter approach: “Many behind the appeals argue that they are simply asking District agencies to do the job they are supposed to do, and these lawsuits are forcing a level of accountability that has been absent for years. However, I think most of us agree that we shouldn’t primarily be making our land use decisions in the courts. That isn’t good for anyone. Maybe so. Certainly, the Court of Appeals is no expert in land use planning. Nevertheless, the Mayor, the Mayor’s Agent and her Deputy Mayor might want to brace for another setback. Taking aim at Shaw’s decision, lead attorney Andrea Ferster argues in the Friends of McMillan Park’s brief that from the get-go, Shaw failed to consciously consider the recommendations of the Historic Preservation Review Board (“HPRB”), the panel in his department that designates historic property and advises the Mayor on historic preservation matters. Ferster homes in on “loss of integrity to the site” and finds no evidence Shaw even considered HPRB’s finding that demolition of the site is inconsistent with the Preservation Act, choosing instead to cherry pick from a staff report related to the conceptual design of new construction and make assertions beyond the scope of his review. She cuts through Shaw’s reasoning, taking apart his use of incorrect legal standards, omission of key witness testimony, reliance on the project’s selling points to declare legal compliance, and failure to consider that saving a few of the sand cells is not enough to compensate for demolishing the majority. Yet a more crucial area of vulnerability exists: VMP and DMPED seem to have bet the farm—and Shaw has backed the bet—that dedicating 1 million square feet of a 2 million square foot project to health facilities will demonstrate special merit to the Court of Appeals. This is where the District’s project could very well come apart at the seams. Shaw doesn’t bother to claim with any specificity that the facilities will provide “social or other benefits having a high priority for community services,” as required by D.C. law, Ferster notes. In fact, no experts or health providers have testified that health facilities are needed at the site, and there are no provisions in the Comprehensive Plan—the master document that establishes the framework and guides interpretations of planning and zoning policy—that make concentration of health facilities a priority. Even if the court were to accept Shaw’s claim that such facilities could be a “plausible means for bringing commercial development to the site,” she argues, there is no precedent that marketability or profitability confers special merit to justify demolition of a historical landmark. Oddly, D.C. officials do not show much introspection or trepidation regarding their likelihood of success, either. In fact, Mayor Bowser has quietly re-programmed $21 million set aside for McMillan in 2019, leaving less than $100,000 to keep the project alive. When The Dig approached city officials recently they seemed unprepared to talk about the project at all. On a sweltering day at RFK recently for a “groundbreaking” to announce the coming of athletic fields and recreation facilities, Bowser introduced planning officials as her “Big Deal” team. Taking advantage of so many big fish in one barrel, The Dig approached Shaw and asked him to rate his confidence level—using the McLaughlin Group “Zero-to-1o scale”—that the court will uphold his decision. Bowser walked away when asked about the subject—hardly unusual—but then turned around long enough to say that she had already taken questions from the media. Her chief of staff, John Falcicchio refused to turn around at all and kept walking. Deputy Mayor Kenner looked perplexed and suggested that the project was a fait d’accompli, approved by virtue of the decision by the Mayor’s Agent—Shaw. Reminded that a request for court review is pending, with a hearing scheduled for October 17, Kenner said he was “very confident” that the project would go forward as proposed, and climbed into the back of a large black SUV and drove off. *This post has been updated. 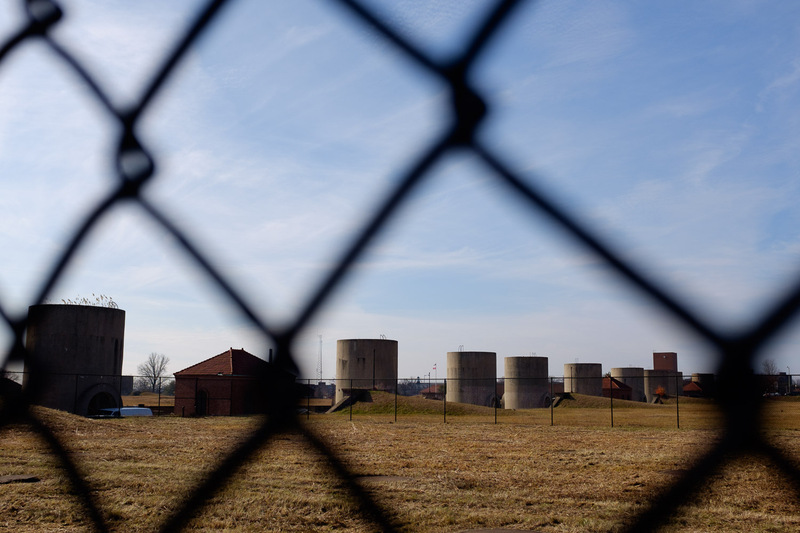 The landscape of the McMillan facility was designed by Frederick Law Olmsted Jr. And just two of the 20 sand cells will be preserved under the current proposal; Though the developer deemed 16 of them unable to be preserved, two have already been demolished.